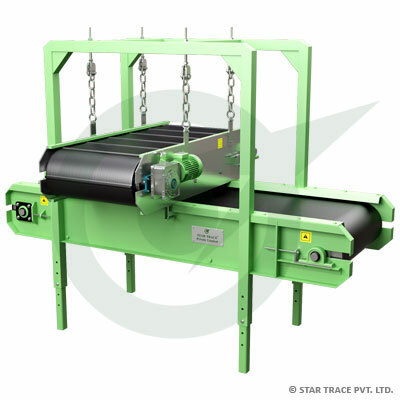 Overband Permanent Magnetic Separator | Coal Processing | Star Trace Pvt. Ltd.
STAR TRACE Permanent Magnetic Over band separators are powered by ceramic focused flux, strontium ferrite magnets for superior coercive force. The magnetism in these equipment is produced by an internal assembly of the above magnetic material. This assembly is enclosed in a non-magnetic housing. Star Trace design concentrates attractive power on the surface where it is needed most. The magnetic strength of the permanent magnet will match that of the corresponding size of the electromagnet used for the same application. In Over band permanent magnetic separator, continuous cleaning is made possible by a heavy duty clad belt that encircles the magnet on a series of rotating pulleys. As ferrous metal is attracted and held by the magnet, the moving belt carries the collected metal outside of the magnetic field where it is then released beyond the product flow. For extra protection from tramp iron. For increased product cleaning .